Cuba's sentencing of more than 30 dissidents to lengthy prison terms has prompted international outrage. A White House spokesman said the recent crackdown was proof that President Fidel Castro's government remained a "totalitarian blight" on the region. The EU Commission also called for the immediate release of the dissidents, who were prosecuted for treason in closed courts and who have been handed down lengthy sentences. On Wednesday, Luis Enrique Ferrer, a member of a Cuban reform group, received 28 years - the longest sentence so far. Ferrer was a local co-ordinator for the Varela project, a petition campaign which seeks political reform on the communist-led island. 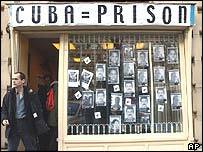 All the defendants were convicted of working with the US to undermine the government of President Castro. Others who received stiff sentences include opposition leader Hector Palacios, who received a 25-year sentence, while the poet and writer Raul Rivero was given a 20-year sentence, as was the economist Martha Beatriz Roque. Independent journalist Omar Rodriguez Saludes received 27 years. Many of the group of 78 Cuban dissidents rounded up over the past three weeks are still waiting to hear their fate. Human rights groups worldwide have condemned the trials, and the US State Department has accused the Cuban Government of using "Stalinist tactics". The US House of Representatives unanimously passed a bill on Tuesday condemning the dissidents' arrests and the harsh sentencing of many of them. "We are not going to reverse our policy of helping the dissidents," said national security spokesman Michael Anton. President George W Bush was "deeply concerned" about President Castro's heavy-handed tactics, he added. The German Government said the trial "flagrantly breached the most basic elements of the rule of law and human rights". 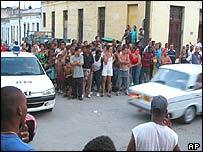 But neither the EU Commission nor Germany indicated that trade and co-operation agreements with Cuba were immediately under threat. Their rebukes follow a strong protest from Canadian Foreign Minister Bill Graham to the Cuban ambassador in Ottawa on Monday. BBC correspondent Stephen Gibbs in Havana said the sentences indicated the most serious crackdown on domestic opposition in the country since the 1960s. And Brian Alexander, director of the Washington-based Cuba Policy Foundation which lobbies for an end to the US embargo on Cuba, said the crackdown suggested President Castro was no longer willing to tolerate challenges to his unstable rule. "Castro's charm offensive with Europe and the US is over," he told BBC News Online. "If this is the case, we can expect to see relations soured by harsher rhetoric and Castro demonstrating a lack of interest in multilateral ties." Mr Alexander said it seemed a strange time to provoke American antagonism, given that - despite the current administration's dislike of the Cuban regime - the US Congress has been working to lift the embargo. "Almost 80 poets, doctors and even economists were rounded up in March"